This was a bit scary but a lot of fun. I’d say the talk was very well received. A big thanks to Jimmy Moore who actually gave me his speaking spot a year ago. During the Q&A none other than professor Robert Lustig was the first one to step up to the microphone. He basically agreed with everything, but wondered if removing most of the sugar and adding more fiber to the diet would not be enough. This to avoid being “extreme”. We also agreed that it is not clear yet if such an approach would be as effective for weight loss and blood sugar control. My guess is that it would not. A modest change = modest results. Later I spoke to none other than Boyd Eaton, the godfather of the Paleo movement and the first speaker on the conference. He liked my lecture a lot. I may have dreamed, but I think I heard him call it “the top talk of the conference”. Probably a dream. The lecture was recorded on video and I will upload it to YouTube when I am back in Sweden. Tjenare Andreas, great meeting you at the Symposium. I had to leave early for my high school reunion but my friends also say your presentation was the best one. I look forward to seeing the recording soon. Thank you for sharing that and looking forward to the video. Yes, I'm always amused by the apologists who, rather than accepting the truth, want to keep one foot in the past. You are way nicer than I am when it comes to speaking with them, I'm sure. Removing most of the sugar would already mean a very big change for most Americans and - alas - most Europeans as well. And it would be a great first step towards a better diet. Only a first step, mind you - but you have to start somewhere. I wonder, though, why many people appear to be so obsessed with fibre. This probably all goes back to Dr. Cleave, the "bran man" and was made worse by the F-plan, a diet devised by Audrey Eyton that was popular in the 70s. We were basically advised to stuff ourselves with wheat bran - ih my opinion and experience this is one of the worst thing you can do to your bowels. And a high-fibre diet was never shown to protect anyone against colon cancer or even diverticulitis. Most people believe that you need "roughage" to move your bowels - but you don't. If you did every Massai and Eskimo would be constipated all his life. Mezzo, I think you will find that this obsession with bran and roughage goes back at least as far as the early vegetarian movement in the persons of the Kellogg brothers and within Seventh Day Advantism in general. Likely earlier but I'm more versed in the history of hucksterism than of vegetarianism. Looking forward to your video upload, especially your conversation with Robert Lustig. He impressed me with his video about fructose. Bye the way: I like your blog! You were not dreaming. Boyd told me he thought your talk was the best he'd seen at the symposium. Kudos to you! To the other commenters: I think Lustig's question did not stem from some view of fiber as a miracle food, but from its role to slow down absorption of sugar either in the context of fruit or starch being broken down into monosacharides (sp?). Lustig is a cautious scientist and was only gently questioning how firm the science was on the necessity of a completely low carb diet as compared to a healthy carb diet. I think that's an interesting and important scientific question that has not received enough attention. None of this takes away at all from the importance of low carb (high fat) diets on fighting obesity and improving health. It is clearly one of the most effective and safest treatments one can undertake! 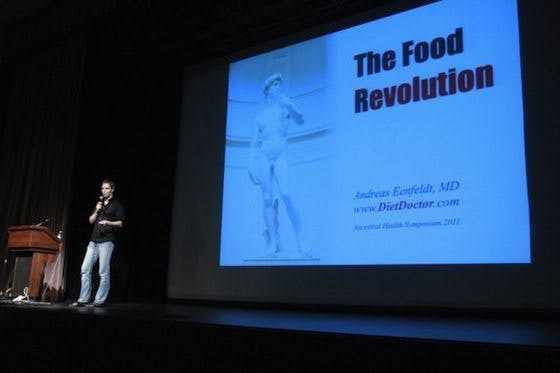 Thanks to Andreas for championing this valuable approach and for giving the best talk at the first annual Ancestral Health Symposium! I agree with Aaron/ Boyd. Best talk at the symposium. I really liked how you took complicated material and broke it down to make it very understandable. You were awesome and made the science very accessible. I particularly liked your experiments on yourself showing the graphs of your blood sugar when eating two different diets, that was really powerful. Your talk *was* great! Very cool stuff going on in your neck of the woods. Hope you had a nice reunion! Hopefully the next AHS will be as least as great, no repeats of high school reunions though. Regarding Lustig I loved his presentation – to me his lecture was number one. Certainly removing excess sugar would be a potentially enormous first step toward healthier diets. That's the goal. To make the complicated easy to understand. A hard thing to do sometimes, but necessary if we are to make millions of people realize the mistakes behind the low fat dietary advice. Andreas, you were aiiiight! LOL! So glad you got to be a major voice at this event. And you did a spectacular job as I knew you would. Aiiight! Thanks, I really appreciated the opportunity. Lustig's approach wouldn't work for me. When I started my nutrition studies I put myself on the so-called heart healthy low fat, high carb diet. Everything was 'whole and complex' with lots of fiber -- no white flour, white sugar, high fructose corn syrup for me -- and lo and behold I gained 50 lbs in 3 years -- and for half of the time it was relatively calorie controlled too. I have never been so sick in my life. No half measures for me -- I have to keep my carbs under strict control. I also thought your presentation was the best! Really impressed my medical school daughter! I can't wait to watch it on youtube! But Diet Doc's are still missing from the list. And still no official video's online and no explanation for the delay. You'll need to have the slides available from slideshare as he talks. Slides not available on Slideshare as yet. They would help as he talks so fast it's a job for my brain to keep up with what he's saying, maybe if I saw the slides at the same time I'd do better. I found with the Lustig talk the slides on slideshare caused the system to crash. I solved it by listening to Lustig on the PC while watching the slides on on my laptop. It would help synchronisation if the speakers notes on slideshare were changed so it's possible to know what time in the talk the slide was shown. My preference would be posting the presentations on a site that presents the video and slides side by side, synced and annotated. Your talk was, indeed, one of - if not the - best! Well done!! I'm glad I got to hear it. Heard your interview on Robert K. Su's podcast the other day. Also noticed you did a poster at AHS11, is it available online? I would have really liked to see you talk at the AHS. Maybe at AHS12? We need more expertise, like yours, on the subject of a sustainable _and_ healthy food supply.